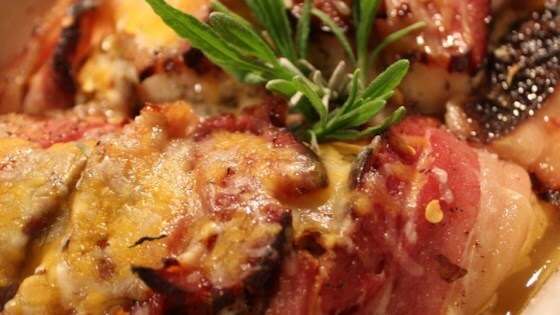 "Chicken with lavender, bacon and cheese. Everyone appreciates lavender for its scent and flowers, but very few people have tasted it. Its unique flavour blends very well with chicken." Place three sprigs of lavender on top of each chicken breast half. Wrap two slices of bacon around each piece of chicken keeping the lavender inside. Place chicken into a shallow baking dish. Season with salt, pepper, and red pepper flakes. Position the baking dish on the top shelf in the preheated oven, and bake chicken for 20 minutes, turning once. Turn again so the lavender is on top, and sprinkle with shredded cheese. Continue baking 10 minutes, or until cheese has melted and chicken juices run clear. Thanks for the recipe, Angel, but dried lavender is almost impossible to find in our area, to say nothing of fresh lavender. The recipe is just ok with the dried lavender. I'll keep searching. This is absolutely wonderful!!! I made it for my picky boyfriend and he loved it!